Geelong was once one of the largest manufacturing hubs in Australia and has been the home to the likes of Ford, International Harvester, Shell and Alcoa. Geelong has had a fascinating history in the automotive and manufacturing industry, but as our city transforms into a thriving tourist destination, we cannot afford to lose the history of where we came from. The GEELONG MUSEUM OF MOTORING + INDUSTRY is a community project that’s working to preserve Geelong’s rich manufacturing heritage for future generations. The museum tells a story of the region and why Australia has long been considered a car-centric nation. 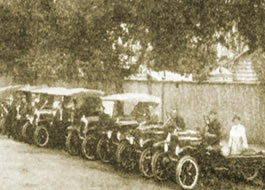 The motor car has revolutionised the way of life in the 20th century. It has allowed people to travel where they desire, in comfort and security, at a time of their own choosing. Many technologies have played an important role in it progression and the GEELONG MUSEUM OF MOTORING + INDUSTRY highlights such developments. A community project the GEELONG MUSEUM OF MOTORING + INDUSTRY is an important part of Geelong’s re-development and is maintaining its status as Australia’s leading interactive automotive museum. The GEELONG MUSEUM OF MOTORING + INDUSTRY showcases Motoring culture, past, present and future, in an entertaining and educational environment. Mid 1996 a dedicated team started work on what would become one of Australia’s premier automotive attractions and one of the jewels in the Geelong Steampacket Place project which went on to transform the waterfront area of Geelong. The site was home to one of Dalgety’s Woolstores which spanned much of the waterfront area before being used for several warehouse style retail store selling furniture and carpets. In the mid 1990’s Deakin University purchased the land to complement their Woolstore Campus which was under construction. 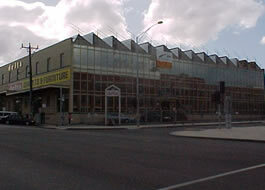 The original plans for the Ford Discovery Centre was for it to be built on the South East corner of Brougham and Gheringhap Streets, but with Deakin’s purchase of the property on the South West corner of the intersection there was much more room and scope for the Centre’s exhibition. The Ford Discovery Centre Site late 1990’s during early construction. 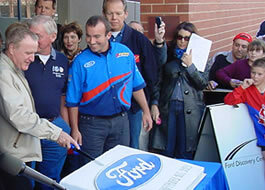 With a joint partnership between the State Government of Victoria, Ford Motor Company of Australia and Deakin University plans of the centre were launched in a huge ceremony at Deakin’s Costa Hall at the Waterfront Campus in with the premier of the time Jeff Kennett on the 17th of July 1997. In October of the following year plans for the centre were well underway and as part of the State Government’s Access 2001 the site of the centre was opened to the public to give them a glimpse of the exciting plans of the centre. As years passed, the climate of manufacturing in Australia began to decline and Geelong’s economic priorities shifted. The growth of higher education in Geelong meant the Deakin University needed to broaden its facilities, which sadly lead to the closure of the Ford Discover Centre in 2012. In 2014, a group of dedicated local motoring enthusiasts and community leaders made it their mission to salvage the remaining collection of the Ford Discovery Centre. It was clear that this collection needed a new home that would foster and celebrate Geelong’s rich heritage in motoring and manufacturing. So, the Geelong Museum of Motoring + Industry was born.